Team Yew is training hard for our 60km big charity walk across the South Downs on May 15th. It’s in aid of the Child Welfare Scheme, friends of Yew who do great work with children and young people in Nepal. Find out more about them (and maybe sign up for the walk too!) here. Drop us an email at info@yewclothing.com if you’d like to join us. The Biggest Race of the Year! Greetings from Yew HQ! Things are as busy as ever here but the sun has us in a good mood. Running season is here and it’s almost time for the biggest: the London Marathon. We are going to be at the London Marathon Exhibition at ExCel in the Docklands from 21st to the 24th of April. Entrance is free and there will be lots of interesting things to see and do, even if you’re not running the actual race. See directions to ExCel Exhbition Centre here. We will be offering special discounts on all our clothes so it’s the perfect time to update your running wear. Our Everywear Tops are made from a lightweight fast wicking fabric so they’re perfect whether you’re running a mile or a marathon. The fabric comes from recycled plastic too, so you can be (literally) comfortable in the knowledge that you’re doing your bit for the environment. If you can’t make the show – take advantage of our 10% offer below. Spring is here, so we’re offering 10% off to our newsletter subscribers. Just enter code SPRING10 at checkout to get your discount! 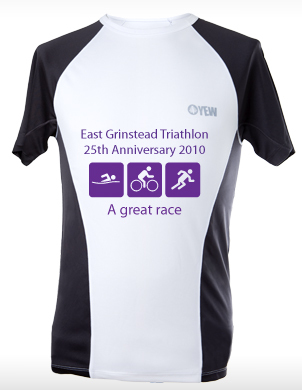 We are very excited to be the official shirt providers for East Grinstead Triathlon Club’s 25th Anniversary Race on May 16th. The race t-shirts are being sold in aid of the Prostate Cancer Charity. Both Yew Clothing and East Grinstead Tri Club will be donating money to them for every shirt sold.